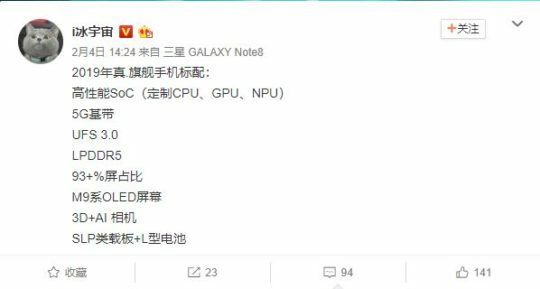 Almost two weeks before the scheduled launch of the Galaxy S9 and the Galaxy S9+, purported specs of Samsung’s 2019 S-series flagship have surfaced in a new rumor out of China. The individual that has provided this information has been correct on multiple accounts in the past. Nonetheless, since it’s still way too early to be speculating about the Galaxy S10, take this information with a heavy dose of salt. Given that the Galaxy S9 is going to be a minor update design-wise, one can expect Samsung to introduce major changes with next year’s flagship. As we see quite an emphasis on artificial intelligence across the industry, it makes sense that one of the purported specs includes a dedicated neural processing unit for enhanced AI features. Alongside it an updated Exynos processor and new UFS 3.0 memory; the latter of the two doubling the data transfer speed of the current generation while being more power efficient. Support for 5G is also said to be present on the Galaxy S10, as 5G networks are expected to be commercialized in the coming year. Samsung may also employ a larger “L” shaped battery to improve battery life. Additionally, we may end up seeing the next generation of the Infinity Display, with an illustrious screen-to-body ratio of 93%. A big focus on 3D tech may also be present with features like facial recognition being improved. Definitely take this information with a grain of salt, though, as we more than a year out from a potential release of this device. In the meantime check out some of the Galaxy S9 features we at SamMobile are looking forward to, and some leaked cases, renders, and specs for the much anticipated upcoming flagship. Rumor says it would make coffee. I love rumors that knows what samsung itself does not knows, because it’s not even on the drawing tables yet. I’ve heard that there will be a Oreo update for a phone i recently paid lots of money for…and it still hasn’t happened. Do major updates usually work as well ? Seems like I see a lot of reports of problems on major updates on older phones ? Not gonna be the S10 though. Horrible name for it. But rumours have fallen short since the S6.